Successfully Added Trackermax GX1 Deluxe GPS Tracker with SOS Calling to your Shopping Cart. Accurate and instant GPS tracking just became a lot easier (and affordable) with the Trackermax GX1 Deluxe GPS Tracker. Brought to you in a compact form factor design for maximum travel ease, this handy GPS tracker has tons of functions and will work anywhere across the globe. It even has an extremely convenient SOS two-way calling feature! Thanks to its high sensitivity GPS chipset and Quadband GSM network compatibility, the Trackermax GX1 Deluxe GPS Tracker provides reliable satellite information from anywhere in the world. 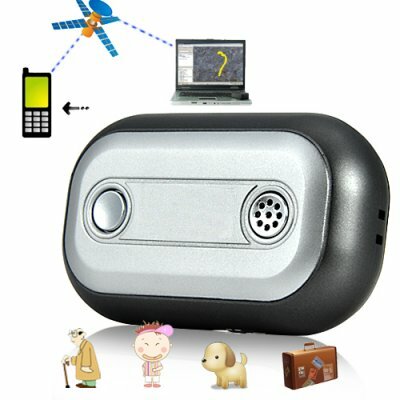 Combine that with its wide range of useful functions and you have the ideal GPS tracking tool to help you easily keep track of important people and objects. SOS calling and Two-Way Calling: One-button SOS dial out to a preset number, or call the SIM card number within the Trackermax GX1 Deluxe GPS tracker and it will automatically answer, allowing you to have a two way conversation with the person in possession of the device, or simply just listen in to conversations. Geo-fencing control: When the tracker moves in/out the preset scope, it will send an SMS alarm to the authorized phone number for SOS. Movement alarm function: - If the tracker is moving, it will send an alarm to a preset phone number. Track on Demand: Track by SMS, phone calls, or automatically through preset time intervals. The tracker will reply with its current latitude and longitude (which can be directly entered into a graphic map software like Google Earth or Google Maps), as well as moving speed, direction, and more. ...And much more! Best of all, everything is easily set up with the included software! So many uses, such a versatile product. The Trackermax GX1 Deluxe GPS Tracker is in stock right now for single piece and bulk purchases. These devices usually go for twice the price, but this one is proudly brought to you at a factory-direct price from the leader in wholesale electronics, Chinavasion. Click "Add to Cart" right now and we'll express ship you a sample to see for yourself how amazing this special little device is - while supplies last! Easily enter latitude and longitude coordinates into Google Earth or Google Maps for visual of location. Note: This item sends SMS messages though a GSM cellular network. The SIM card you install in this product must be a working SIM card (an active account). You likely have one of two problems - First, does the SIM card have money left or is it part of an active account? Second, does the SIM card you inserted have a PIN code or security pass code? You cannot use a SIM cards with a security pass code inside the GPS tracker.